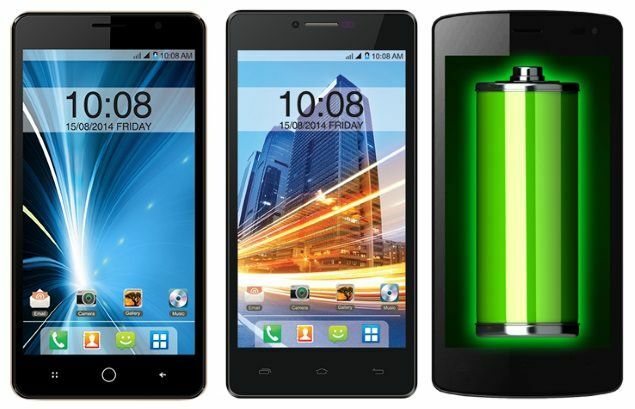 The domestic smartphone maker Intex has launched three new Android KitKat powered smartphones in the country. The devices include the Intex Aqua Star, Aqua Star HD and Aqua Star Power, priced at Rs 6,990, Rs 8,690 and Rs 7,490 respectively. All these devices run Android 4.4.2 KitKat out-of-the box and are powered by a 1.3GHz quad-core MediaTek processor, paired with 1GB of RAM. The Intex Aqua Star, the most affordable of the trio, features a 5-inch IPS display with a resolution of 854 x 480 pixels. The phone sports an 8MP autofocus rear camera and a 2MP front shooter, and packs in a 1,800mAh battery. The Intex Aqua Star HD has the same 5-inch display, but offers HD resolution and is based on One Glass Solution technology. It offers a 13MP rear shooter and a 5MP front camera. The phone comes with a leather-finish back panel and is available in white, black, maroon and red colours. It also lets you cold access apps from the lockscreen by drawing the first letter of an app. The Intex Aqua Power features a 4.5-inch FWVGA IPS display with a resolution of 854 x 480 pixels. It sports an 8MP autofocus camera at the back and a 2MP shooter in the front. As its name suggests, the phone offers a large 3,000mAh battery. All the phones come with dual-SIM slots, 3G, Wi-Fi, Wi-Fi Hotspot and Bluetooth connectivity options. They have 8GB of internal storage, which is further expandable up to 32GB via a microSD card. They also come pre-loaded with apps such as Matrabhasha, Intex Play, NewsHunt, Zapak and XenderDr.